Over the past two months, the issue of land ownership and settlement has, at times, dominated headlines in Israel, whether it is the destruction of an illegal Bedouin village in the south of Israel, the destruction of an illegal Jewish settlement in the West Bank, or the violence and the personal and national tragedies which accompany these traumatic events. In some ways it feels as if we have not moved much beyond 1948, each side fighting to control every square centimeter of land between the Mediterranean and the Jordan River.Whether we are talking about one state or two, we are not talking about a lot of land: The size of the state of Israel is about 20,000 square kilometers (8,000 square miles) often compared to the size of the state of New Jersey. The West Bank and Gaza are together about 6,000 square kilometers (2,400 square miles), a little smaller than the State of Delaware. I like to think in terms of driving time. I live at the southern end of the state of Israel and it takes me a little over 3 hours to get to Tel Aviv or Jerusalem from Kibbutz Ketura by car. From Eilat in Israel’s south to Metula in the north of Israel, it takes between 5 and 6 hours depending on the route you take and traffic. To drive from Netanya on Israel’s coast to Tulkarem, a Palestinian village in the West Bank, essentially crossing the state of Israel within the pre-1967 borders, takes about 15 minutes. Prime Minister Netanyahu’s office in Jerusalem is about 15 kilometers (10 miles) from President Abbas’s office in Ramallah and about 70 kilometers (40 miles) from King Abdullah of Jordan’s Palace. The fact that we live in such close proximity to one another and to our neighbors with whom we do not see eye to eye certainly adds to the tension in the region but it also emphasizes the unsustainability of an intractable conflict. Many of us in the region maintain that the two-state solution is the only way to satisfy the national aspirations of the Jewish people and the Palestinian people and relieve this tension. This may be the case, but one state or two, it is certain that only through cooperation between the peoples in the region, who are living together in a small plot of land and share natural resources, will we be able to satisfy the need for water, energy, food security, economic growth and nature conservation. As pointed out by Professor Alon Tal, one of Israel’s leading environmentalists and the founder of the Arava Institute, in his new book The Land is Full: Addressing Overpopulation in Israel, the country is on an unsustainable trajectory to grow to between 15 million and 20 million residents over the next 40 years. Jordan’s population has already experienced an exponential growth rate in the past 20 years going from under 5 million residents in 2000 to almost 11 million residents today. This growth includes waves of refugees from Iraq and Syria. The over 4 million Palestinians in the West Bank and Gaza do not have adequate access to water, electricity and sewage treatment. Jordan is the 4th water stressed country in the world and though Israel seems to have solved its water and energy needs for now, doubling its population over the next 4 decades will create new stresses on natural resources and infrastructure. How would cooperation between countries in the region help? A recent agreement between Israel, the Palestinian Authority and Jordan on a desalination scheme in Aqaba is a good example. After a much publicized larger scheme to build a conduit from the Red Sea to the Dead Sea, desalinating 1,800 million cubic meters of water and sending 800 million cubic meters of treated water to Amman, the West Bank and central Israel, was cancelled, a more sensible proposal was approved by the regional partners. The new scaled down scheme will entail building a desalination plant in Aqaba which will produce 80 million cubic meters of drinking water, 35 million cubic meters of which will be sold to Israel and the rest used in Aqaba and the south of Jordan. In return, Israel will sell a similar amount of drinking water to the Palestinians and the Jordanians from sources in the north of Israel. The brine from the desalination plant will be pumped up to the Dead Sea and help slow the rapidly dropping sea level. This scheme not only provides water where it is most needed in the most efficient way but it also helps to build a web of mutual dependency and gives everyone a stake in the stability of the region. In 2016, the Arava Institute launched the Track II Environmental Forum in order to advance cross-border environmental agreements like the Aqaba desalinated water trade agreement. In the Track II Working Group on Renewable Energy, members of which are Israeli, Palestinian and Jordanians, an even grander vision has been raised of a water-energy nexus. Israel now has the ability to produce more water than it needs. With additional investment, Israel could increase its desalination capacity to enable it to supply the needs of the West Bank and Jordan. The Palestinians in Gaza could also build desalinization capacity to supply water to itself, Israel and the West Bank. 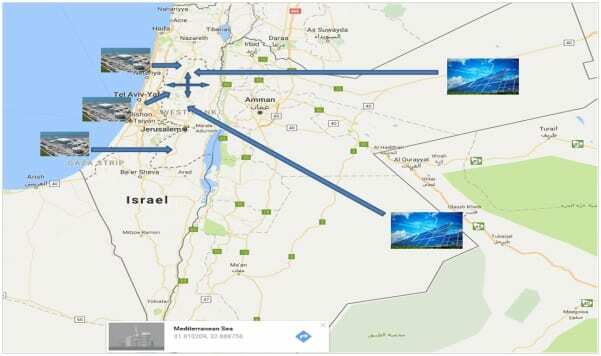 In return, Jordan can use its eastern desert expanse to establish large solar energy fields and produce electricity for the West Bank and Israel, helping to power the desalination plants. The Palestinian Authority would be responsible for maintaining the conduits which supply water to Jordan and electricity to Israel. All three entities would benefit and have a major stake in the stability of the region. As climate change and exponential population growth create new challenges for our region, another hilltop in the West Bank or another wadi in the central Negev is not going to provide the answers to the need of millions of Israelis, Palestinians and Jordanians for water, energy, food security, economic growth and nature conservation. Perhaps the time has come to resolve the issues which divide us, so that together, we can tackle the challenges which unite us.